Seadoo and Yamaha Platinum Engine rebuilds. Full Bore Platinum engine rebuilds. All Full bore engines are custom built, one at a time. 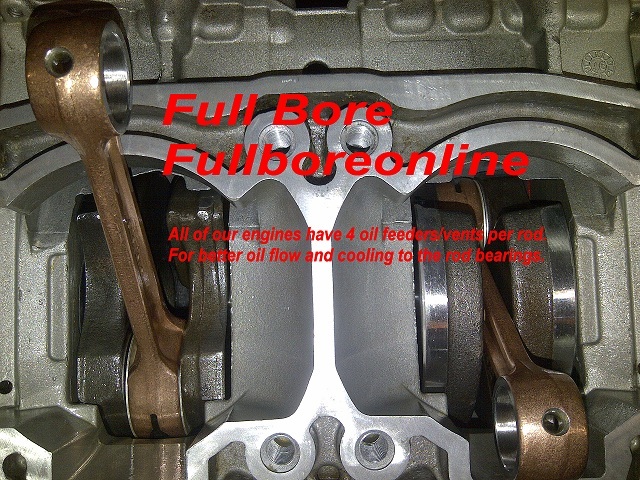 Here at Full Bore we rebuild your PWC 2 Stroke (motor) engine. Must be a rebuildable engine with a good core. $75 return shipping to the 48 continental states. Add to cart complete the payment and print a copy of the receipt and put in box with engine. Shipping instructions are covered on our shipping page. Sea Doo 787/800 947/951 send the Raves (valve only) so they can be trimmed to fit. We do NOT want the plastic caps or housing as they tend to break in shipping. Don't send ignition housing, ignition flywheel, coils, motor mounts, carburetor's, fuel injectors, starter, sensors or exhaust manifold. On the 787/800 RFI and 951 DI also remove water pan from bottom of engine. Severely corroded engines or holed cases may be considered unserviceable!! Don't send ignition housing, ignition flywheel, coils, motor mounts, carburetor's, fuel injectors, starter, sensors or exhaust manifold. All of the Full Bore rebuilt engines are built with new top quality parts, pistons, rings, pins, clips, rods, bearings, gaskets and seals. These aren't SBT remans and we don't and won't use SBT parts in anything we do. We only use parts that over the years and have proven them worthy of being in a full bore engine. All of our machine work exceeds factory quality specifications. Our rebuilds are rock solid and out last and outperform the competitions "Premium" engines. The Platinum rebuild steps it up even further with molly coated pistons and Teflon coated seals to reduce friction. The crankshaft is trued to such tight tolerances that it gives our crankshaft man fits. Our platinum engine rotates easier and produces less friction. This results in less heat, less drag, and more Horse Power, while increasing the dependability. All of our engines are built to last and we stand behind them, with a written warranty on parts and craftsmanship. Our Platinum rebuild now comes with a written 2 year warranty. Every PWC engine rebuild is done one at a time. When we receive your engine for a rebuild it is checked in and tagged and assigned a bin with your name. The engine will stay with the assigned bin until it is completed and returned to you. The engine is disassembled and inspected. We document what appears to of been the cause of the failure and discard the old pistons, rods, bearings, seals and any other old parts other than the core cylinders, head, crankshaft, cases and bolts. The remaining core parts are chemically cleaned and or media blasted. The bolts are cleaned of old sealant, Loctite, corrosion and the threads are chased. The threads in the cases and cylinders are also all chased. This ensures that all bolts can obtain proper torque and apply equal pressure when assembled. The Crankshaft is disassembled (pressed apart) and the rods, pins, bearing, and seals are discarded and are replaced with all new parts including rods with 4 oil feeders per rod. After the crankshaft is reassembled and is trued to perfection and verified on a truing stand. 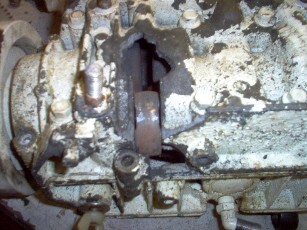 Note we don’t weld the crankshaft to make up for loose fitting cheap parts. We do the final verification for fit and true running in your engine cases where it is supported on all of the bearing surfaces and verified for true in its real running conditions. The cylinders are squared up from the base of the cylinder (to keep it squared up with the bottom end) on a real boring bar made for 2 cycle engines and bored. Not a done with a hone only or other improvised method that some are doing. Then we final sized with the proper hone. We measure each cylinder in 8 places to verify a perfect match to its assigned piston. All of the ports are chamfered in our traditional 3 stage manner. All of the machine work is done in house here at Full Bore and exceeds factory quality specifications. All of Full Bore rebuilt engines are built with new top quality parts, pistons, rings, pins, clips, rods, bearings, gaskets and seals. These aren't SBT remans and we don't and won't use SBT parts in anything we do. We only use parts that over the years and have proven them worthy of being in a full bore engine. Our platinum engine rotates easier and produces less friction. This results in less heat, less drag, and more Horse Power, while increasing the dependability. We spend 12-16 hours on each and every rebuild. No shortcuts, no false claims, no bull, just perfection and attention to detail. All of our engines are built to last and we stand behind them, with a warranty on parts and craftsmanship. Our Platinum rebuild comes with a 2 year warranty. Final finish is with a hi temp, oil and gas resistant gloss black engine enamel. The difference Is the attention to detail and the Quality of the parts. There are many advantages such as; no upfront core charge, you know your engine is the correct one for your PWC, all serial numbers will match and you don't send a good core and get back a patched up saltwater core. It is guaranteed that you will get your same engine back, rebuilt to our engine specs. Scheduling and order of work done is determined by payment received or deposit date. Without payment or a deposit you are not on the schedule. The reason for this policy is simple, we are a small family operated business and we can't afford to invest thousands of dollars into customers engines and have them sit on the shelf until spring. Please note deposits are for engine rebuilds not top end kits or cylinder repair. $500 deposit or payment in full is required before starting your engine rebuild. Immediately after receiving the deposit or payment we will put you on the schedule. Balance of rebuild will be due upon completion. We don't charge a core charge because we are rebuilding your engine. If part of you engine core isn't rebuildable such as a hole in case we have many core parts in stock and would only charge for what is needed and only after contacting you first. This is NOT a good core. severely corroded engines may be considered unserviceable!! All text and images are copyright Full Bore All rights reserved.